Great and interesting reading as usual, Jim. All this talk of the mob makes me wonder how things are today. Is there still a mob with significant influence on many aspects of show business (under which I include comics) or did all that fade away a few decades back? But is this a good thing or a bad thing? With easy availability, a lot of new young people are bound to discover a lot comics that they otherwise never would have seen (both old and new), and some of them will surely hang around as fans and collectors and be drawn to the print versions. Regarding organized crime having an influence on show business: I do not think things are the same as in Bobby Cohen’s heyday. I suspect mob corruption/influence is more street level these days, rather than all the way to the top. Less corporate, less big business, more drugs. The bad news at the top has more to do with corporate raiders, financial predators and modern-version robber barons. Yesterday, I spoke with a very wise, high-net-worth person involved in entertainment and entertainment finance about this very subject. The legal (but reprehensible) and quasi-legal financial manipulations that go on are stunning. Financial pirates, not mobsters, are the problem. And not just in entertainment. David Michelinie’s check didn’t come. It was the Wednesday before Thanksgiving, 1978, I think. Marvel Comics was still sorting out its payment procedures, which went through several changes during the first year I was Editor in Chief. You can read about it here and here. The deal was supposed to be if your voucher was received by the cutoff day one week, your check would be mailed Monday of the next week. By Wednesday, surely, you’d have your check. 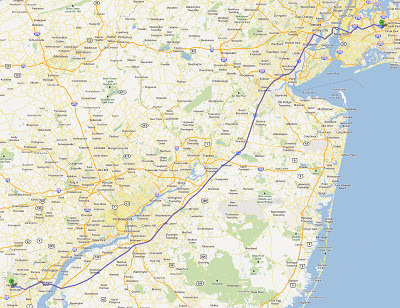 Dave lived in Newark, Delaware. He called me at the office that Wednesday to…umm…gently express his…umm…disappointment? What’s the politest way to say murderous rage? Most of us lived hand to mouth in those days. The business was struggling. Most of us were struggling. Dave was more responsible than most. A solid citizen. He owned a home. He managed pretty well, compared to some of us. But he needed that check. It was the day before Thanksgiving. He had no cash and hadn’t been to the grocery store lately. What was he supposed to do, eat cat food for Turkey Day? I looked into it. Somehow his voucher hadn’t made it into last week’s batch. Bookkeeping had put it aside because of some question about it. I went upstairs and calmly, rationally, at the top of my lungs convinced the money tweezers to cut that check. Right now would be lovely. This is the post that I meant to have up Saturday. Tomorrow’s will be today’s. You know what I mean. Sorry. 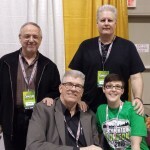 Early on during my time at Marvel, at a convention in New York City, I met a comics fan who was a part-time astrologer. He had a regular day job, some bookkeeping or accounting-type thing, but on the side, he did horoscopes. He liked what I had to say at some panel I was on, thought I seemed like an interesting subject and volunteered to do my chart. Free. Okay. I gave him my date and time of birth and the city where I was born. 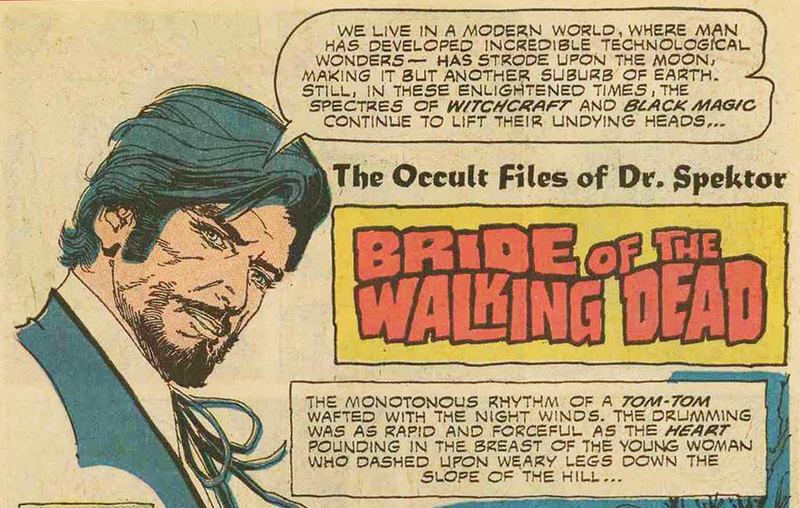 A couple of weeks later, he stopped by the Marvel offices to deliver his work, a hand-drawn astrological chart and his analysis of same. The chart was beautiful. Framable. I still have it, packed away somewhere in the storage space. What he came up with was startling. 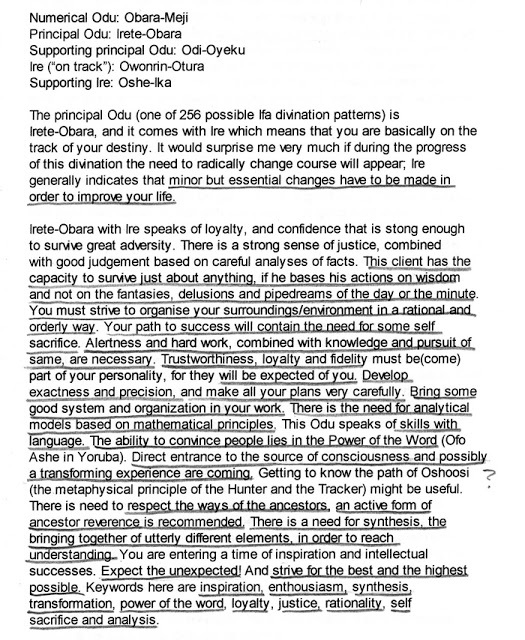 His analysis detailed things about me that nobody knew but people very close to me, and a few things that only I knew. Things that, I assure you, would have been nigh impossible to find out. I’m sorry. 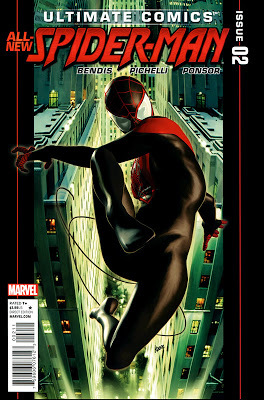 I don’t know Bendis, and as Tom Brevoort pointed out, I wasn’t there. I don’t know how hard he tried and I don’t know if he was snickering when he cashed the checks. I also shouldn’t have said the editorial people were bozos. Clueless, yes, I’ll stick with that. I’ll stick with my unfavorable assessments made elsewhere of the creative management at both Marvel and DC (Didio/Lee, Fine/Buckley, et al), and my negative opinions of the tippy-top brass at both companies who inexplicably allow the madness below. But my remarks about Bendis? No excuse. It was over the top. But I offer this explanation. I wanted to like that book. I really wanted to like that book. Bendis is Marvel’s top gun. I expected to like that book. But the writing really let me down. There wasn’t much of it, some of it was weak and there was not so much as a nod to the fact that the work was done for a serialized presentation. And it was a Marvel book. They—I almost typed “we”—should be better. Somewhere in my dark little heart of hearts, I still have some Marvel in me. I remember the days I was Editor in Chief when DC out-promoted us, out-advertised us, had better production values, had movies while we had none, had more household name characters and we still outsold them three to one. Why? Because, in the words of our circulation V.P. Ed Shukin, we “beat ‘em between the covers.” We were better. We won with good stories, well told. Generally better than theirs, anyway. Video of the NYCC panel I participated in, “Screen Future: Gaming, Comics and TV Around the World and Five Years from Now” may be found here. The panel was moderated by Intel Corporation Futurist Brian David Johnson and included savvy SyFy Channel exec Craig Engler and renowned SF author/visionary Cory Doctorow. 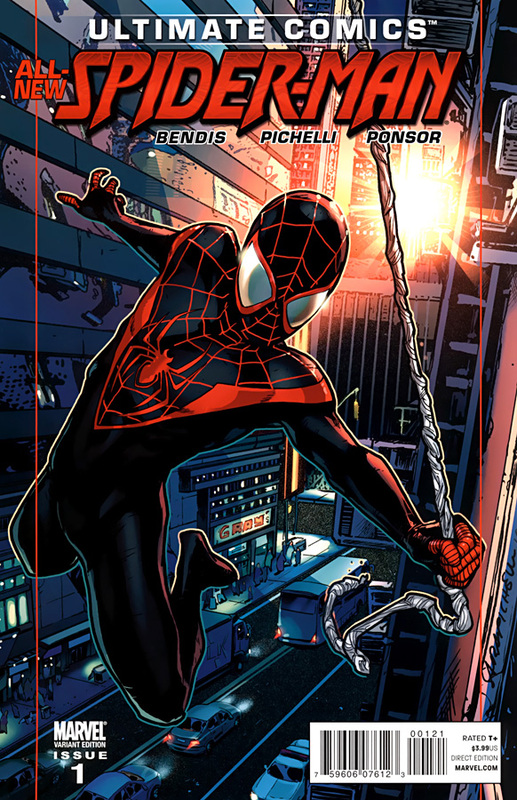 The “standard” cover features Spider-Man swinging through the city, a standard riff. Spider-Man’s pose isn’t distinctive. Make the web into a rope and it could be Robin just as easily. It is also nonsensical, in the sense that the figure doesn’t really seem to be swinging on the web-line. It’s as if he was floating past and reached out to grab it. You probably noticed the Contributions request in the sidebar. I was reluctant to ask you for money, but economic reality has a way of asserting itself. To those of you who have already generously donated to help us keep going, thank you. To all who participate in this wonderfully collaborative blog, thank you. Together, I think we’re building something really special here, a tapestry of views and opinions from different perspectives. To everyone who stops by, thank you. All of you make a difference. Who Can Explain It, Who Can Tell You Why…? This is the introductory paragraph of the series overview I wrote for Dark Horse’s prospective re-launch of the Gold Key title Spektor (formerly Doctor Spektor) that, sadly, never made it to print. “Have you ever met anyone who, at some time in his or her life, hasn’t experienced something inexplicable? Knowing the phone was going to ring a second before it did? A premonition that proved true? A horoscope that was uncannily accurate? Next time you’re at a party, ask if anyone has a “ghost story,” a tale of something spooky that happened to them. Almost everyone does. If you’re wondering, the most skeptical man on Earth, at the beginning, at least, was going to be Spektor. Jim will be on a panel at the New york Comic Con this weekend. technology influencing our rapidly changing world. JayJay here. Jim is delayed and we will be posting the blog a bit later today. Here are some more things that turned up recently. 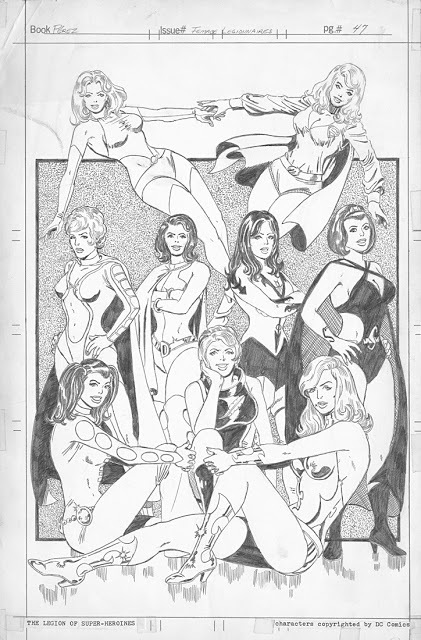 What If George Pérez Drew the Legion of Super-Heroes…? George gave me this. This is the original drawing done for George’s beautiful book PÉREZ* * ACCENT ON THE FIRST ‘E’. It was published in 1977, I think. Marvel gave George a license to use its characters for no charge (or, maybe a dollar). I presume DC did the same. George autographed a copy of the book for me. JayJay Here. Jim will be a bit late with the blog today. He’s helping out a friend with hurricane preparations. And he has to do his own! So, later today.